The Greater Springfield Center for Diversity and Reconciliation is holding a trivia night fundraiser to raise money for its many important community initiatives, including its support of Springfield Black Tie. Childcare will be provided. When: Sunday, Sept. 20th, 6:00 p.m.
At the time that I sat down to write this letter, the streets of Baltimore were being swallowed up by waves of violence, fire, and fear. Anger and frustration have again reached their boiling points following the death of Freddie Gray. A city—a community—is seeking answers as to what caused the injuries that led to Gray’s death while he was in police custody. Earlier this morning, a friend shared the following quote from Martin Luther King, Jr., on her Facebook profile. We share a moral obligation to condemn any act of violence in times such as these, warranted or unwarranted. The authority we have given to our police to protect and serve our communities is not immoral, but police brutality most certainly is. Protest is not an immoral act, but the violence that sadly accompanies many recent protests most certainly is. Whatever issues are present in our society related to race and violence, we must listen to one another. None of us are exempt from the ills of our nation. Our union, no matter how polarized we may be, exists under the premise that all are created equal and that liberty and justice should be extended to each and every one of us. The story that’s being played out in Baltimore and all the other stories like it have carried more than their share of national headlines over the last few months, but I’d like to think that these stories are ones that affect each of us deep within our hearts and our consciences. There are issues beneath the violence and the protest that are causing deep rifts within our society, and they are impeding our ability to love one another and live together in civility and peace. When we meet uncertainty and grief face to face, let’s refuse to offer critiques of others based on perception and stereotypes. Instead, let’s find ways to listen deeply to one another. It just might save a life. Some may see the April 7 election results — by a slim margin, voters repealed the Springfield City Council decision to extend anti-discrimination protection to our gay and transgender neighbors — as a victory for Christians. After all, the repeal effort was led by a group called Christians Uniting for Political Action. **Note: If you would like to add a congregation to this list, please ask a member of the church leadership team to send an official email request to spfdcdr@gmail.com stating that their congregation wishes to be listed on this website as an open and affirming congregation. We want to make sure church leadership wishes to be listed, as there are important and significant differences between being a welcoming church and being an affirming church. (There was some previous confusion regarding listed churches, so we are taking this extra precaution in order to honor the wishes of each church). Thank you for understanding. Over the last few months, those who’ve taken part in initiatives sponsored by the Greater Springfield Race and Faith Collaborative have had several opportunities to draw on resources in the online toolboxes designed to help participants reflect on the various ways that the continuing realities of race and racism affect us personally as well as in our relationships with family and friends. 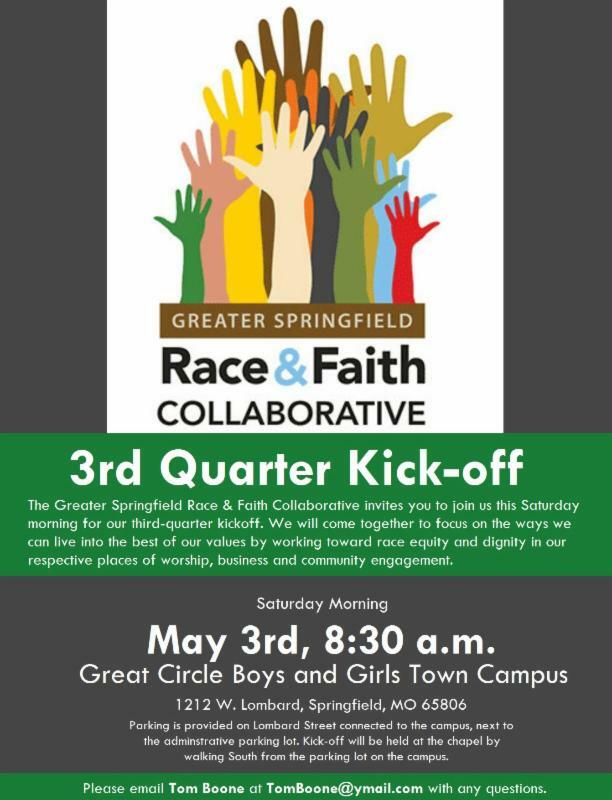 Now, at the outset of the Third-Quarter initiatives sponsored by the Race & Faith Collaborative, we invite you to consider how we can enhance the relationships that we share with one another in our respective places of worship, business and community engagement. Together we can draw upon the best of our shared values as we work toward equality and dignity for all people in all aspects of life. Instead of creating new materials to use as part of the Third-Quarter initiative, we would like to encourage participants to take the lead in one or more of the following action items within the context of their respective places of worship, business and community engagement. You can pick simple, moderate, or in-depth options (or a combination). Option 1: Distribute the “Talking to Children about Racism” resources to parents and/or teachers of children and youth. These are ideal for religious education teams in local communities of faith as well as youth group leaders. Also consider posting them on your organization’s website and letting parents and teachers know where they can access them online. Option 2: Distribute the “Talking to Friends & Family about Racism” and “Responding to Racist Comments & Jokes” resources on your organization’s website and let people know where to access them. Option 1: Host a viewing of Patrick Mureithi’s DVD “Conversation Starters for Family & Friends” with a small group at your place of worship or business. You might consider hosting a dinner party at your house where friends and/or colleagues can view the DVD together. Option 2 (for religious leaders): Encourage all the small groups in your respective place of worship (i.e. Sunday school classes, Wednesday night groups, etc.) to devote one session (or, even better, an entire series) to the “25 Things Your Congregation Can Do To Affirm Diversity and Challenge Racism”. Option 3 (for clergy): Develop and share at least one sermon, reflection or homily devoted to the importance of diversity and equality within your respective religious tradition. Consider leading a special series on the same topic by drawing on the resources available in the “Clergy Toolkit”. 1. Why should we talk about race in my organization? 2. Does race have anything to do with my organization’s purpose and values? 4. Would my organization and the families we work with be better served if we became an anti-racist, multi-cultural organization? If so, how? 5. What does an anti-racist, multi-cultural organization look like? • Consider partnering with a trained organization that can help lead your organization through the process of becoming a place that strives for the dignity and equality of all people. The leaders of the Race and Faith Collaborative are happy to provide recommendations of organizations/trained diversity leaders with whom your organization can partner. • Understand that the work of becoming an organization that moves forward in its goals of striving for the dignity and equality of all people is difficult. It can be full of challenges and struggles. Yet it is also full of great rewards. For encouragment and inspiration, stay connected with other leaders and organizations that are dedicated to the same goals. Together we can do great things and we will be proud to look back together with a profound sense of gratitude for all that we accomplish in the name of dignity and equality. The Interfaith Alliance of the Ozarks has announced that those who wish to stand in solidarity with our Jewish sisters and brothers following the tragic and senseless acts of violence that took place yesterday in Kansas City are invited to gather outside of Temple Israel this evening as participants from the synagogue gather for the Passover Seder, which begins at 6pm. Those wishing to stand in solidarity with their Jewish sisters and brothers are invited to meet outside of Temple Israel at 5:45pm and stay until about 6:15pm. Temple Israel is located at 5910 S Farm Road 193, Rogersville, MO 65742.